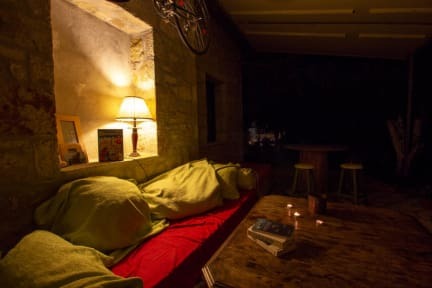 This is the best hostel! I can’t believe how lovely it was for the price. 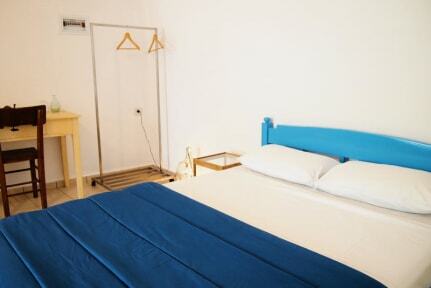 Clean, spacious rooms, lovely big modern kitchen, plenty of bathrooms, delicious breakfast. The garden is huge, perfect for relaxing and has 7 hammocks!! 5 mins from the beach and staff will help you with anything you need. Perfect. Here is the best hostel in my life. It's super huge and very clean also have a super huge orange's garden where all the guests always there. All staffs are very nice. I love this hostel so much. Breakfast here so great too. Himara hostel is the BEST Place to be in Himara! The atmosphere is chill and relaxed, the yard is wonderful and the staff is very friendly and helpful. The hostel is close to the beach and the restaurants. We ended up staying for a week in the hostel instead of 3 days because the place was so amazing and Himara beaches are so beautiful! Milto was a great host and we felt a home. Also highly recommended : order the hostel's pizza - it's the best. Very cool hostel staff we great and helped a lot with advise on getting around. Breakfast was good and the garden area is really cool. A little unorganised but in a good way. Definitely recommend. Nice social hostel. Could do with more lockers and plug sockets in the dorms. Clean, good breakfast. Cheap bar. Really beautiful hostel with awesome outside area. Close to the beach and town with good breakfast. Don't forget mosquito spray! there are lots of them!! Really lovely hostel with a nice garden and cats waking around. The only improvement that could be done is to have the breakfast earlier, starting at 8:00, because 9:00 is a bit too late. We loved our stay here! A very chilled out vibe w/ very friendly staff! 5 minute walk from the center of town. We were lucky enough to get a semi private bed in a dorm which was perfect, however it was quite hot at night and the mosquitoes were quite bad (pack spray!!). Overall, would highly recommend if you are looking for somewhere to chill out for a few days! It’s a relaxed and cool place with a homey atmosphere. The staff didn’t seem to know much or really care, got really vague and unknown answers when asking things and no information at all about the place when I checked in.